that afternoon we drove into town for a look around and on our return had a walk around the park. What a nice place! Lots of shade, lots of grass (too many bindii’s for bare feet though and I found out the hard way! ), a swimming pool, and a lot of terrific people. Some had come to the Alice for a few days or weeks and found they couldn’t leave; it gets into your blood, they said. 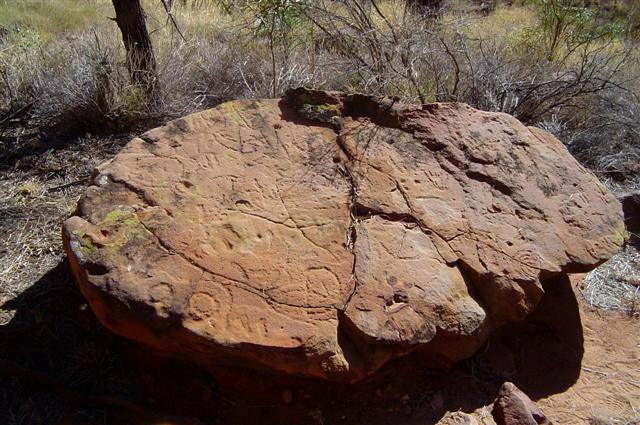 traditional owners, the Arrernte people, and the culture and traditions are displayed in the work of local Aboriginal artists. 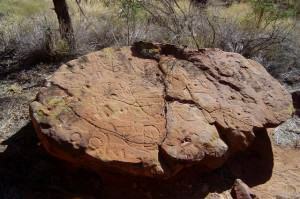 This work is presented in the many galleries and art centres throughout the town and the Alice is where some of the world’s most sought-after Aboriginal artists live. I was really looking forward to doing a little exploring. We had a list of things we wanted to see and do while here but with only a few days in The Alice our chances of seeing and doing it all were pretty slim. Still, we were going to give it a darn good try and that meant an early night so we settled back for a quiet evening with a couple of steaks on the barbecue and our bottle of Two Tails Sparkling Wine to celebrate our first night in a new caravan park. 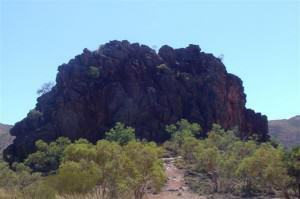 on me right now, wagging her finger, and saying “see, you should have been paying attention!” Truly awe-inspiring, it is called Angkerle by the Aboriginal people and is named for Mrs Ida Standley who became the first school teacher in Alice Springs in 1914. In 1925 when the school moved to Jay creek she became its matron and also the first non-Aboriginal woman to see the Chasm that now bears her name. 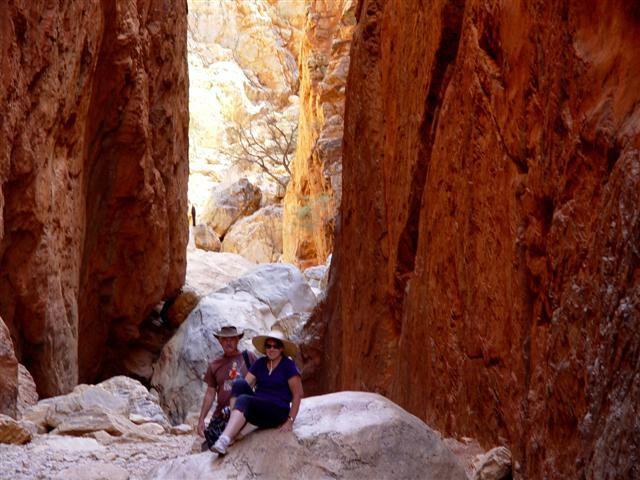 We took the path down to the Chasm marvelling at the rock walls rising up some 80 metres (262 feet) above us; they were all of that rich red iron oxide that gives the Red Centre its name. 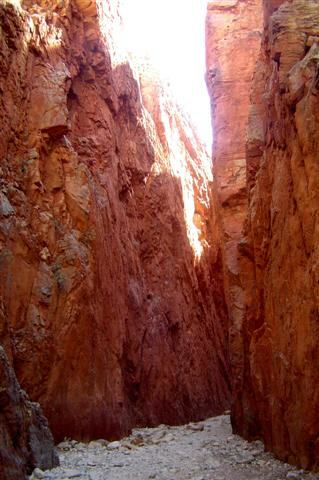 The most dramatic time to see the Chasm is around noon on a sunny day. The sheer walls glow from reflected sunlight and create a breathtaking display. 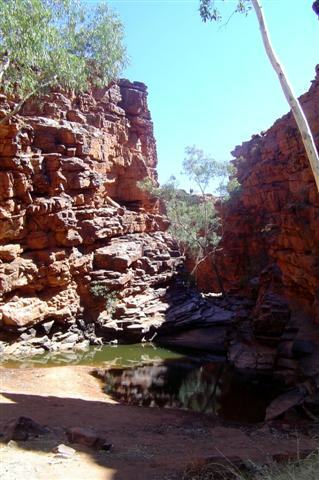 There is a walking track that links the car park to the Chasm and it follows a creek where there are many spring-fed pools. 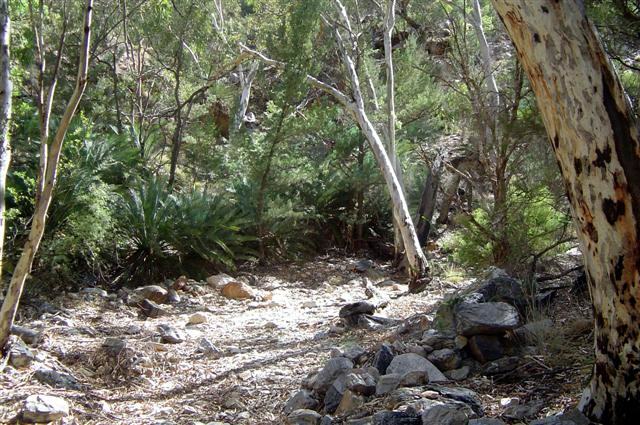 Because of these pools, the gully floor is lush with a variety of plants includ­ing the cycad palm, a species that is known to have survived from pre­historic times when this whole area was suppos­edly an inland sea. The track is quite rough in spots and we climbed over rocks and through shallow crevasses before finally reaching that deep red cleft in the earth. We were astounded by its beauty and wandered throughout the actual Chasm for ages. The fact that it was also cool in there was a big plus. The Chasm is not very long from one end to the other and is a reasonably easy trek as long as you don’t mind the odd rock or boulder to climb over. Wearing sensible shoes goes a long way towards making it easier, too. I would have liked to have stayed there longer but there were other places to see this day and so, after a nice cup of coffee in the café, we set off for Simpson’s Gap, another beautiful landmark in the Australian landscape. Renowned as the place to see the Black-footed Rock Wallabies, the Gap is also remarkable for its towering red gums, standing proudly like sentinels. 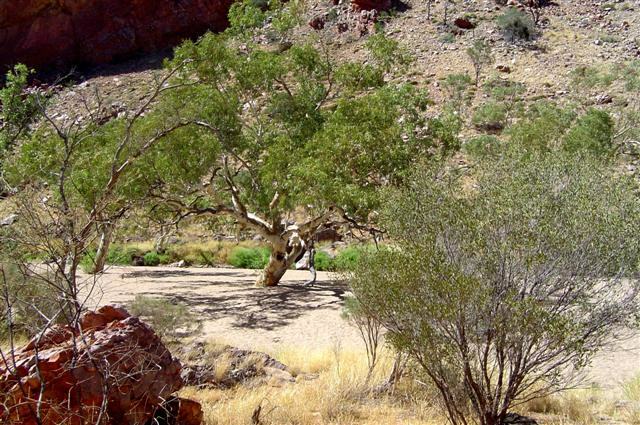 Located 18 kilometres (11 miles) from town, Simpson’s Gap is a permanent waterhole of the Arrernte Aboriginal people. A scenic, rocky gap containing huge ghost gums and timbered creek flats, it is typical of many gaps and gorges in the region. 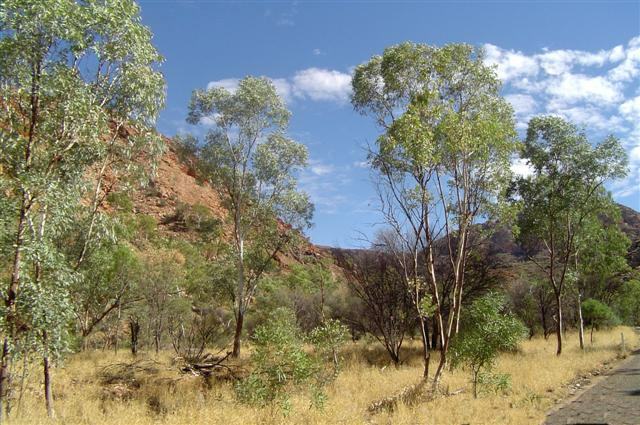 It was formed millions of years ago when a break occurred in the quartzite that forms the MacDonnell Ranges. As the land surface rose, flood waters cut into the rock scouring out the Gap as we see it today. There was only a little water at the Gap, stagnant, smelly water in small pools but it didn’t detract from the beautiful surroundings. through the dry river bed. We didn’t see any of the wildlife supposed to live here and I was a little disappointed at that, not a wallaby, not a bird, not even a snake (thank heavens!) but, as John said, how many saw us! 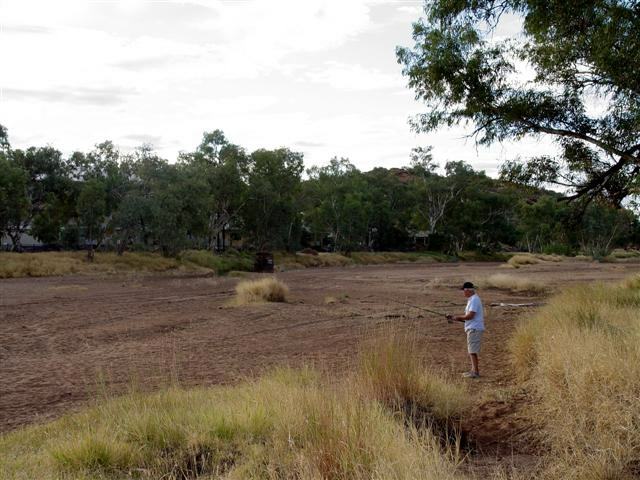 By the time we’d returned to the carpark it was lunch time and we stopped at the Visitors Centre where we found some interesting information on the local flora and fauna and some about finding water in the outback. And, of course, just being able to stand in the shade for a while was good, too. We had planned to continue on to Hermannsburg, the birthplace of famed indigenous artist Albert Namatjira and location of the first Aboriginal mission but as it is approximately 100 kilometres (62 miles) further on we thought better of it today. On our way back we stopped briefly at the grave of theReverend John Flynn, founder of the Royal Flying Doctor Service. Located 7 kilometres (4 miles) from Alice Springs, it marks the final resting place of his ashes. 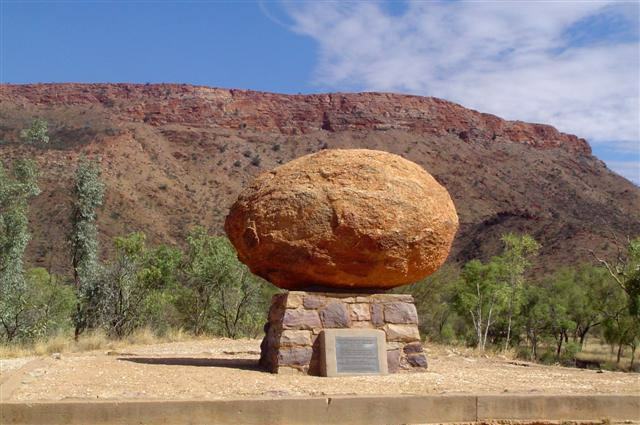 The rock on top of the memorial was brought here from the Devil’s Marbles, to the north near Wycliffe Well, a matter of some controversy with the local indigenous population as the Marbles, or Karlu Karlu to the Aboriginal people, is a culturally significant site. Alice Springs is a remarkable town, surrounded as it is by desert that is a patch of red dirt the size of Europe. It is more than just an oasis, it is a thriving metropolis, boasting one of the world’s best desert golf courses, its own casino, conven­tion centre, and botanical gardens, and a climate where the sun shines almost every day. wanted road. 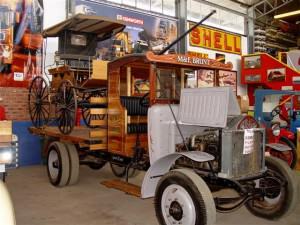 And so, outvoted, we set off to look at cars, trucks, and motorbikes dating back to early last century. Outback road transport, the good, the bad, and the definitely practical! everything I’d ever wanted to know, and an awful lot that I didn’t, about said cars, trucks, motorbikes, and road trains! Some of it was actually very interesting but definitely not my cup of tea. The guys, however, had an absolute ball. 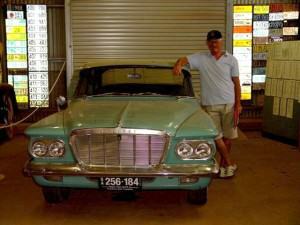 John discovered a 1962 “R” series Valiant, just like the one he used to own and he was in heaven. 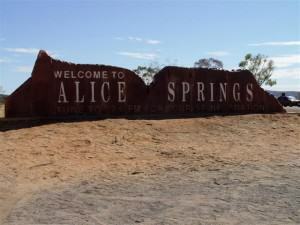 Alice Springs. 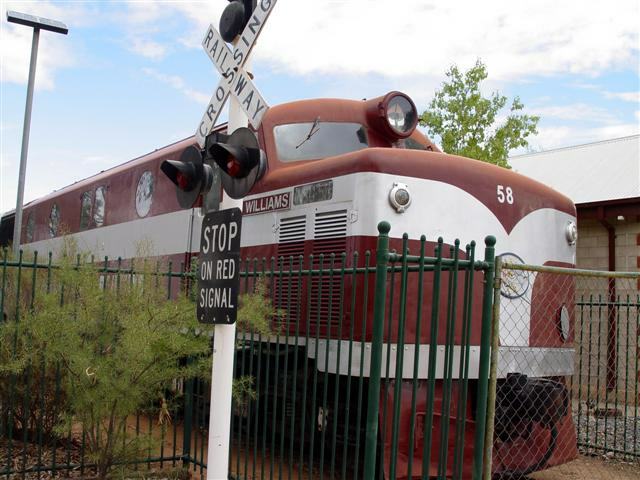 The transport hub for one of the remotest regions in the world, it is more than 1500 kilometres (932 miles) from the sea in any direction and is the birthplace of the roadtrain. By the time the guys had seen every vehicle and debated the merits and mechanical ability of each one, it was too late to visit the area devoted to the railways with its restored rolling stock. A shame because I think I would have really enjoyed that. all that is required is a sense of the ridiculous. John didn’t catch any fish (surprise surprise!) and the local indigenous population gave him a wide berth – strange man that white fella!! The next day we gorged ourselves. 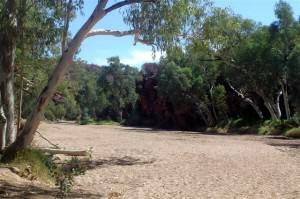 That’s right, N’Dhala Gorge and Trephina Gorge in the East MacDonnell Ranges. N’Dhala Gorge is 91 kilometres (56 miles) from Alice Springs, along the Ross Highway before turning onto an unsealed road for the last 11 kilometres (7 miles). 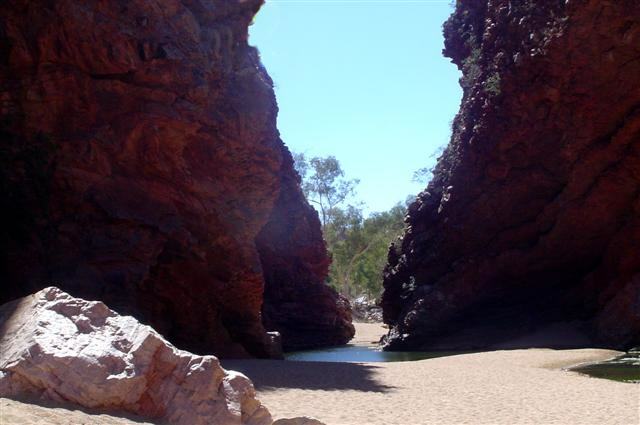 It’s a track with several crossings of the Ross River but N’Dhala Gorge is most definitely worth the drive. 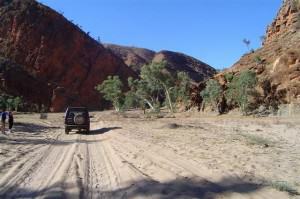 The road in is 4×4 only and completely impassable during periods of rain. And considering the number of times we crossed the dry river, I can understand that. rocks. Knowing how much snakes like to hide around rocks there was no way I was leaving the path in any case! We walked along a rockpool or dry creek bed and could see the waterline on the walls of the gorge from the last heavy rains; the water can get quite deep here. In the gorge the petroglyphs on Caterpillar Dreaming were amazingly detailed and it’s hard to imagine that some of these carvings are more than 10,000 years old. There are quite a lot of the carvings that haven’t stood the test of time; the weather and the forces of nature having taken a toll. But there are several others in very good condition. 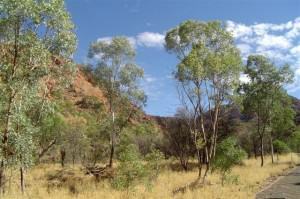 Stories from the Dreamtime preserved for all eternity. The walk took a little over an hour; it wasn’t an arduous trek by any stretch of the imagination but by the time we re- turned to the car we were certainly hot and tired and a cup of tea was definitely the order of the day! Adjoining the car park is an area with a few picnic tables and a great information booth and we sat there for our cup of tea. takes about 6½ hours and there are also bicycle tracks here. 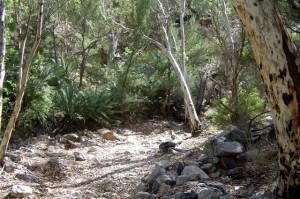 On our way back to the highway we discovered an interesting track that leads to the John Hayes Rockhole. I say the track is interesting because it makes the Oodnadatta Track look like a highway! At least there was no dust. The rockhole with its steep, narrow rock walls is a very popular swimming hole during the warmer months. Staring up at the top of the cliffs was enough to make a person dizzy but we could hear voices and could see people walking around the rim. I wondered where the path was but we couldn’t find it. 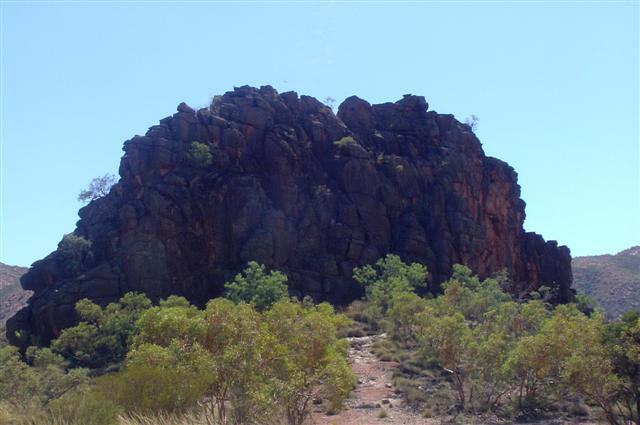 Our next stop was Corroboree Rock, a massive monolith that, as the name implies, has a great deal of cultural and ceremonial significance for the local Aboriginal people. The specific significance is not generally known and the lack of water in the area means that it was probably not used as a corroboree site. Regardless, the size of it was most impressive. 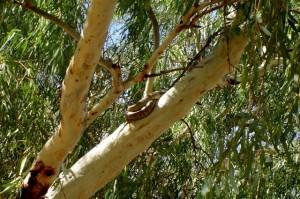 of a gum tree. 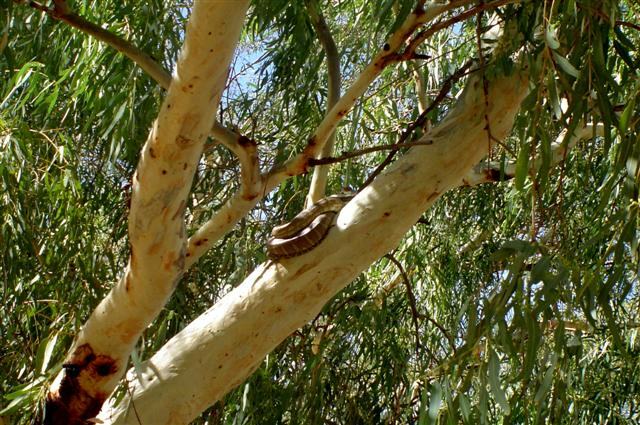 At least we assumed it was a python and we assumed it was asleep. In any case, it didn’t move and I had no intention of disturbing it! By the time we returned to camp it was getting late and it was time for us to start packing up to leave. 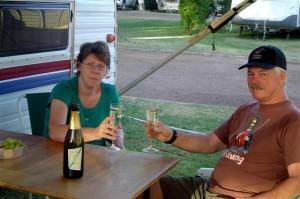 There is so much more to see and do in Alice Springs and we barely blew the dust off the surface in our few days there. If we could have delayed our departure, believe me we would have but it was not to be. Having said that, though, we have a pretty good reason, if we even needed a reason, to return one day.